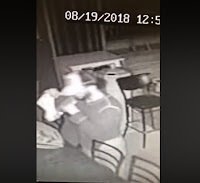 Thursday, august 30, 2018 - A man broke into a church and stole equipment of unknown value and before leaving an apology note. According to CCTV footage, the man can be seen stealing electronic appliances from the church. The incident occurred at the Mt. Olive Church in Connecticut at approximately 12:53 AM. The police are looking for assistance in identifying the male robber from the CCTV footage. Interestingly, it’s reported that the church Minister did pray for the suspect during the next service.